Chinese Language and Culture program invites you to design an official sticker for our students in 2018. 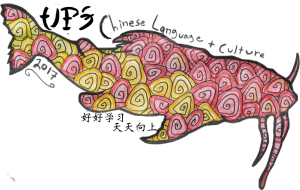 One winning design will be voted in by ALL current and past students in Chinese language and culture courses at UPS. Winning design will be used to to produce the 2018 UPS Chinese student stickers which will be available for purchase to the entire campus community in March/April, 2018. Contestant does not need to be a student taking Chinese. Each design could be submitted by one individual or a group of designers. Submissions will be accepted Now – February 24, 2018. Voting will occur online February 27 – March 9, 2018. The final art will be selected and announced on March 21, 2018. Your sticker design must be a piece created specifically for the Chinese Language and Culture program at University of Puget Sound. Your sticker design must be a piece designed by you, featuring images and ideas that you own all the rights to, or have permission to use. Sticker designs can be in various shape (square, circle, etc. ), and visually attractive when scaled down to a 3×3″ graphic or similar size (such as 2×4″). Graphic should be submitted in on a white background, to allow for proper printing. Graphic should include “Chinese Language and Culture” and “University of Puget Sound” (Or UPS, PS or Puget Sound). The year 2018 must also be visible on the sticker. Winner will need to be able to share a print-ready copy of the design. Dream up the best sticker design you can. Sending in a scanned PDF file of your design to Prof. Perry at perry@pugetsound.edu. Deadline of submission is by midnight of February 24.